What’s the Best Font for Resumes? We’re designers, you and I. And when family or friends come to us with their awful resumes, we strip them down to their essentials, fit them to the allotted space, give them some decent margins and properly tension the page. They get the interview; they get the job. Why? Maybe it’s because they had the added confidence of a professionally composed resume. Or maybe their new employer just thought something felt right. Maybe their resume worked. So what’s the best font for resumes? This often leads to a discussion about what the field and position is, who the applicant is, and of what whom needs convincing. Why so many questions? Can’t I just name a font? I could, but as it turns out, this is precisely the sort of question I get from people who are in no position to receive an answer. Imagine me entering a hardware store and asking where the best nuts for bicycles are kept. “A nut for what size bolt, sir?” the clerk responds. “Uh, one on my bike. I’m not sure.” The clerk tries to be helpful, “Do you know if it’s metric or customary? How about the thread?” Me: “Ooh. I could try something flashy; got anything chrome plated?” One would think that because I ride my bike everyday, I might take more interest in these little details. In my example however, the reverse is true. I don’t even own a set of wrenches—I’ve never picked one up in my life. I don’t know the difference between a crescent wrench and an allen wrench. Luckily for me, bicycle shops exist. To the professionals now reading this who do not consider themselves designers (we get mostly designers here), hello. I presume you come with the same question. Let’s stop for a moment and answer it. The best font for resumes is Palatino. You can get it here but check your word processor’s font menu first. It’s likely already waiting for you. Moving on. You see, fonts don’t fix your resume’s inability to accomplish its basic tasks. That’s the job of design. A designer can with a single text face create many successful compositions, pursuing varied and nuanced qualities or styles just by the way the type is arranged. It’s at this point, after a designer has developed a sense for and command of his or her type, that he or she is in a position to benefit from having the “best” font for the job. And the questions these designers ask me are much more descriptive. “Could you suggest a good warm sans with an American feel, but that doesn’t look too dated?” Yes. I can, in fact. Hey non-designers, still with us? Forget that Palatino thing. That was just—well—when people phrase the question that way, “What’s the best font for …” they’re usually out for a simple and inexpensive answer. If I suggested that the best font for their resume would cost them $125, they’d probably rephrase the question in a hurry, “I meant the best one out of the options already on my computer.” This is generally what I read the initial question to mean. If however, you’re still willing to put money on this, let me suggest the best place to spend it: hire a designer. Your designer will be able to see the problems you can’t, and has the tools and experience to create for you what you need. Okay, but what if you’ve got no budget for design? It’s rare, but it happens. I would then look to my circle of friends to ask if there’s someone they know who could spare an hour. Opening it back up to a general audience, let’s return to the question of who you are, because I think here’s where we’ll find the best clues on how to design this resume and which typefaces will work with the composition. Think descriptive thoughts, and write down descriptive words. Professionally speaking, who are you, and who do you want to become, and what kind of work will get you there? If that doesn’t give you enough to work with, consider your influences. Describe the music you listen to, the writing style of an author whose books you read, the city or country you live in, the way your parents or siblings talk, or walk, the sound of the musical instrument you play. Finding some descriptors that work? Now use type in an understated way that fits the description. Different faces will perform differently in this role, so I suggest using something fairly versatile starting out. Robert Slimbach’s Minion is a popular one. I’d also recommend Thomas Gabriel’s Premiéra which I’ve come to know well. As your ability to create and control context becomes more refined, you’ll be able to identify and incorporate the characteristics of different typefaces into your compositions. A few last bits of advice: Work with the text in a single size. Use placement and typographic features such as italic or bold, as well as advanced features like small caps, to create a clear hierarchy. The colors used should offer sufficient contrast as well. I recommend black on white. And here are a number of other considerations from last week’s piece on the same subject. Good luck. This feels more like a homework assignment than a how-to, but maybe that’s best. Typography is a discipline that’s learned by some study, but mainly by practice. Using Type continues here Thursday. This entry was written by David Sudweeks, posted on April 11, 2013 at 9:00 AM, filed under Using Type. Bookmark the permalink. Follow any comments here with the RSS feed for this post. Trackbacks are closed, but you can post a comment. 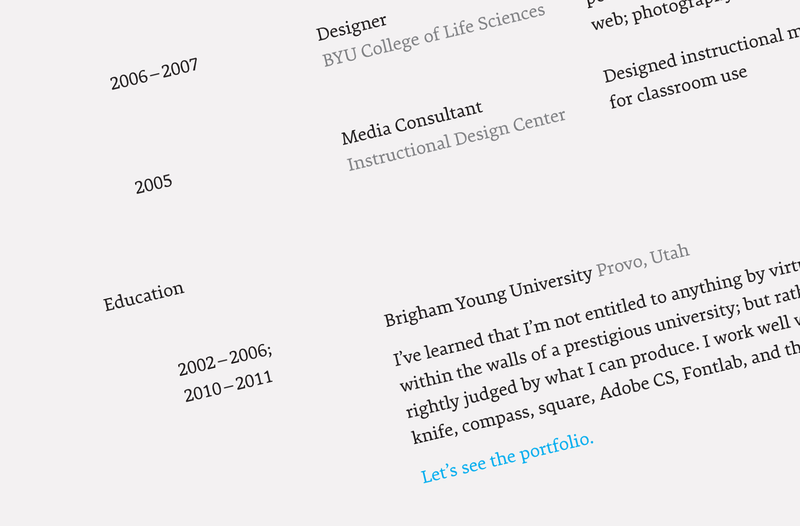 Many designers say the best typeface for a resume is a neutral one. If the typeface is too noticeable, it distracts from the content, which is more critical. In the past, it would have been Helvetica then Myriad worked well. Sometimes, News Gothic and other plain Janes. If it was more affordable, we’d see more Thesis. Sometimes Interstate works well. But now, there are so many superb typefaces by so many foundries that would work for a neutral application, it will take some research to find one perfect for you and that is affordable. I won’t touch the serif or not to serif question. My preference is a humanist san serif family for resumes that, more importantly, are laid out perfectly in the perfect point size, leading, head, and sub head fashion. No decorations or odd paper. Keep it simple and let the information impress. Make your portfolio of work be where your design shines. What’s the font on the picture of the resume? Thanks in advance. That’s Premiéra, one of the faces listed above.